Everyday, hundreds of students of Westlake High School trek through the long hallways, completely starved of decent cellular connection. Since the renovation in 2015, the building has added new flooring and remodeled the football field. Despite these impressive structural aspects, WHS is one of the many high schools in the US with limited access to cell phone service. With this concern, many students and administrators have expressed dire concerns about the restricted reception of cell phone service. The school’s structure has blocked wireless connections, hindering incoming phone calls and texts from parents and employers from work. Because of these difficulties within the networking system, many students have argued that prevalence of service drop can be irritating at times. “I think it is a little frustrating. It gets really hard to make important phone calls in the hallway and the library. I had to make some important phone calls to colleges in the library, and I would always have to ask to go to an area where there is service,” says Meghana Tandon. Beyond this, some administrators also share similar opinions, believing that the reception can be weak through many areas of the school. “I do have frequent drops in my service as well. However, if I stand next to the window, I will get a signal. But depending on where I am in the hallways, I will have to walk to an area where service is available or communicate through my radio,” says Ned Lauver, the vice principal. As digital media continues to play a larger role in today’s society, limiting our cell phone’s ability to communicate with the outside world may lead to a more insecure and inconvenient environment. Often times, students find themselves in need of cell phone service to handle calls and texts with parents in areas where reception is blocked. 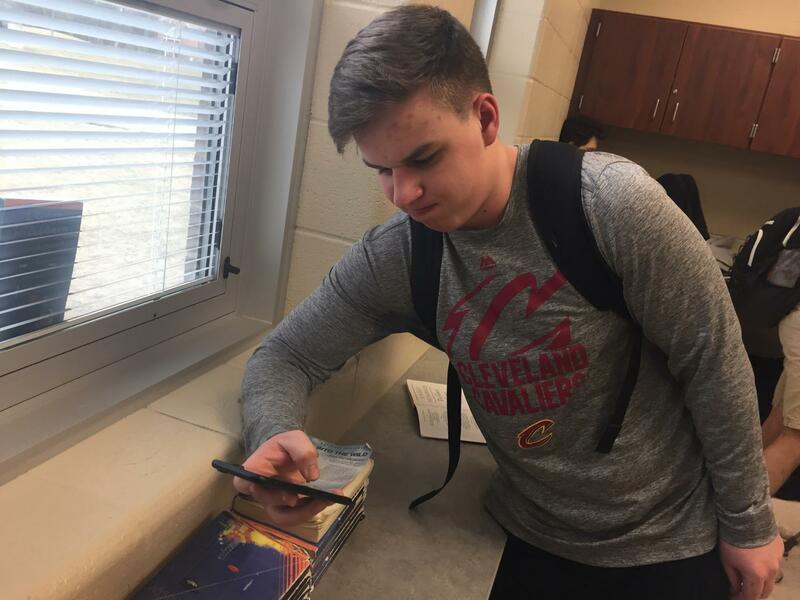 “That usually happens about 6 to 9 times per day, when I need to text my mom something important but then there is no service,” says Andrew Franklin, a junior and treasurer of the Business Club. With these emotions, many others have fear of isolation during times of peril. “If I need to dial 9-11 in a situation, I can’t make the calls in the hallways because there no service. It takes too much time for me to reach a telephone located in the classroom. This can potentially place myself in greater danger,” expressed a student. In these cases, what may seem a trivial annoyance can be potentially life-threatening. However, school administrators have assured that there are ways to circumvent these dangers. “I don’t necessarily think that is a safety issue. We have landline phones in every classroom and common areas. My take is that in a emergency situation, we have a lot of communication ability going on in the building and staff trained including the use of the PA system. I am not sure that in a situation like that, a student being on their cell phone would be more effective that the procedures that we have already,” says Ned Lauver. Beyond these risks and detriments of limiting cell phones, others have claimed that allocating reception may be beneficial and may even create a better learning environment. “School would be more efficient. Instead of trying over and over again to find service, I can just try it at once and get right back to work. If I am doing independent work, it would be better to do it on my cell phone as I would not have to keep flipping back and forth on a textbook,” says Andrew Franklin. With the prevalence of technology, cell phones are increasingly becoming a larger aspect of education. Students claim that they often have homework questions saved on their phones and have digital flashcards saved on their phone. As a result, expanding the access of reception may lead to a community that is more engaged in academics. Hopefully soon, there will be solutions to this dilemma, giving equal access of reception to everybody.